Psycho is a 1998 American horror film produced and directed by Gus Van Sant for Universal Pictures and starring Vince Vaughn, Julianne Moore, Viggo Mortensen, William H. Macy and Anne Heche in leading and supporting roles. 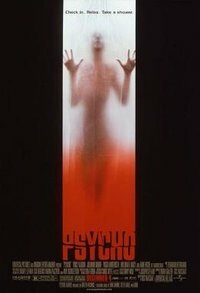 It is a modern remake of the 1960 film directed by Alfred Hitchcock, in which an embezzler arrives at an old motel run by an insane killer named Norman Bates. Both films are adapted from Robert Bloch's 1959 novel of the same name, which was in turn inspired by the crimes of Wisconsin murderer Ed Gein. Although this version is in color, features a different cast, and is set in 1998, it is closer to a shot-for-shot remake than most remakes, often copying Hitchcock's camera movements and editing, and Joseph Stefano's script is mostly carried over. Bernard Herrmann's musical score is reused as well, though with a new arrangement by Danny Elfman and recorded in stereo. Some changes are introduced to account for advances in technology since the original film and to make the content more explicit. Murder sequences are also intercut with surreal dream images. The film received negative reviews and was both a critical and commercial failure. It received three Golden Raspberry nominations and won in the categories of Worst Remake, and Worst Director. Heche was nominated for Worst Actress. This webpage uses material from the Wikipedia article "Psycho_%281998_film%29" and is licensed under the GNU Free Documentation License. Reality TV World is not responsible for any errors or omissions the Wikipedia article may contain.